The Cookie Connection, Issue #012 -- Happy Spring 2012! Making, Baking, Sharing, and More for Busy Home Cooks and Beginning Bakers! It's been a while since our last newsletter and we're sorry for that. But we will work hard to make it up to you! Be sure to read all the way to the bottom of this newsletter for some very special information about our FREE giveaway! We are very excited to share with you our very first eCookbooklet - Easy Cake Mix Bar Cookies: 25 Tried & True Recipes. Not everyone has the time to bake cookie bars from scratch. The good news is that many wonderful and easy cookie bar recipes start with a cake mix! That's where Easy Cake Mix Bar Cookies: 25 Tried & True Recipes comes to the rescue. We've gathered our favorite easy recipes for bar cookies and they all begin with cake mix, so there's less measuring, fewer ingredients, and lots of time saved. All recipes are tried and true, from family, friends, community cookbooks and our own extensive recipe files that have stood the taste-test of time. If you're not familiar with ecookbooks, we think they are the wave of the future, allowing you to keep all your favorite recipes with you in one handy device. Just imagine having your favorite cookbooks loaded into your favorite ereader device (Kindle, Nook, iPad, etc.) and available to you everywhere all the time. Whether you're on a family vacation or shopping at the market, all the necessary ingredients and cooking instructions for your favorite recipes are always right at your fingertips. If you don't have an ereader yet, Amazon offers a free app that allows you to download and read ebooks on your computer. Chocolate Chip Cookies remain some of the most requested recipes, so we now have a whole section dedicated to everyone's favorite cookie! Lunch Box & Travel Cookies offering recipes for cookies that travel well. If you have any suggestions on specialty sections or favorite cookie recipes that you'd like to see on Best-Ever-Cookie-Collection.com, please let us know. Better yet, share your own favorite cookie recipe on your very own page on Best Ever Cookie Collection! Should I be using salted or unsalted butter when baking cookies? Most of the recipes you'll find on Best Ever Cookie Collection call for butter, which enhances the flavor of cookies and brownies. Most serious pastry chefs suggest unsalted butter, but we've never noticed an appreciable difference when using unsalted or lightly salted butter for most baked goods, unless the recipe directions give specific instructions to use one or the other. We tend to use whatever we have in the fridge. Also, it's best not to use butter to grease your pans. Butter actually melts at a lower temperature than vegetable shortening and as a result, it may leave ungreased gaps on the pan and your cookies and bars may stick. What's the difference when baking in a conventional oven vs. a convection oven? Do I have to adjust baking times if using a convection oven? That's a great question Sue. Obviously, conventional ovens are more popular but many people may opt to upgrade to a convection oven. All the recipes you find on the pages of Best Ever Cookie Collection were prepared with a standard, conventional oven. In a conventional oven, the heat source is located in the bottom of the oven so the heat rises up through the oven relatively evenly. However, in a convection oven the heat source is located behind the wall of the oven and a fan works continuously to circulate the warm air throughout the oven. You can expect your baked goods to cook more quickly and evenly in a convection oven because of the hot air blowing onto the food. When baking with a convection oven, you may need to do some experimenting with small batches until you get a sense of how much time is needed. You can keep the temperature the same and decrease your baking time by 20 to 25% or lower the temperature by 25 degrees and decrease the baking time just slightly. Please submit your cookie questions and we'll try to answer them next time. An oven thermometer may be the best baking investment you will ever make! It is very likely that your oven temperature is inaccurate. All it takes is a small discrepancy of 5 degrees and it will affect your results. The good news is that there's a quick and inexpensive solution - an oven thermometer - that can be found in the baking section of most supermarkets and kitchen stores. Simply follow the instructions on the package of your oven thermometer to properly place it and preheat your oven. Once your oven indicates it has reached the temperature setting, check your oven thermometer. If the oven temperature is higher on the thermometer than the setting you selected for your oven, then you will need to set your oven that many degrees lower. For example, if you set your oven to 350F degrees and the thermometer reads 375F degrees, you will need to adjust your oven down to 325F degrees to achieve 350F degrees. Be sure to leave the thermometer in your oven and get used to checking it for accuracy every time you preheat the oven. A fun, quick and easy no-bake cookie recipe for kids of all ages! In a large microwavable bowl, add the chocolate, hazelnut spread and espresso powder and cook on High for 1 1/2 to 2 minutes or until chocolate is almost melted. Be sure to stir every 30 seconds to prevent overheating. Stir in puffed wheat cereal. Quickly drop by teaspoonfuls onto prepared wax paper-lined cookie sheets. Store cookies in tightly covered container in the refrigerator. Come Join Us on Facebook! Have you become a fan of Best Ever Cookie Collection on Facebook yet? If not, what are you waiting for? Please consider this your official invitation to visit us at www.facebook.com/BestEverCookieCollection where we are bringing together a community of like-minded cookie lovers. To become a fan, just click the "like" button on our Facebook page. Join our online conversation and stay up-to-date on all the latest news. AND, by becoming a Best Ever Cookie Collection fan on Facebook, you'll be eligible for our special fan giveaways and be able to chat with us as well as the other visitors on our page. Our favorite thing about our Facebook page is that it's a place where we can connect with so many of you all at once! 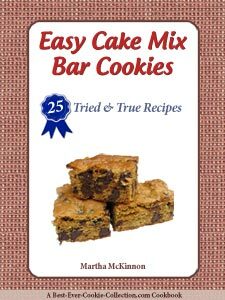 This month we'll be giving away one FREE copy of our new eCookbooklet - Easy Cake Mix Bar Cookies: 25 Tried & True Recipes - to one lucky Facebook fan. Visit our Facebook page for more information and to become a fan today. If you like this ezine, please do your friends and us a big favor and "pay it forward" by forwarding this newsletter. If a friend did forward this to you and you like what you read, please subscribe by visiting Best Ever Cookie Collection. PLEASE NOTE: For an easy-to-view version of this newsletter, or past issues, please visit the Best Ever Cookie Collection Back Issues Page. Until next time -- wishing you lots of Cookie Joy -- Cookie Baking, Cookie Eating, Cookie Sharing!